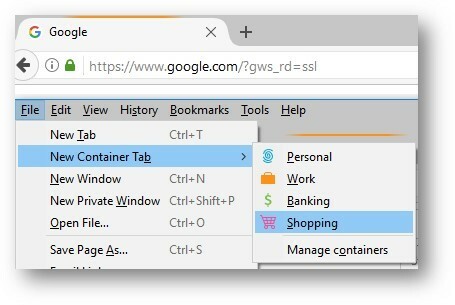 As of Firefox version 50 (version 52 is the current one) you can now open tabs in different “contexts” such as “work”, “personal” or “banking”. These “containers” as Firefox calls them are each isolated from each other which means that things like cookies aren’t shared between them. This means that you can log into websites using multiple identities and you no longer need to either keep a separate browser or switch to incognito/private browsing mode. In the screenshot below you can see that I’m signed into Google under both my personal container as well as my work container. We all portray different characteristics of ourselves in different situations. The way I speak with my son is much different than the way I communicate with my coworkers. The things I tell my friends are different than what I tell my parents. I’m much more guarded when withdrawing money from the bank than I am when shopping at the grocery store. I have the ability to use multiple identities in multiple contexts. But when I use the web, I can’t do that very well. There is no easy way to segregate my identities such that my browsing behavior while shopping for toddler clothes doesn’t cross over to my browsing behavior while working. The Containers feature I’m about to describe attempts to solve this problem: empowering Firefox to help segregate my online identities in the same way I can segregate my real life identities. To use containers, just select “New Container Tab” from the File menu. Windows users, if you don’t see the “File” menu press the “Alt” key on your keyboard to show it. Location of “New Container Tab” menu item. This entry was posted in Random things I learned and tagged firefox, firefox containers. Bookmark the permalink.